The nervous system is an important part of the human body and it is responsible for carrying signals between the brain and other parts of the body. Nerves play an important role in transmitting these signals and when these nerves are damaged due to the diabetes it leads to diabetic neuropathy. Diabetes is a disease that is characterized as a body’s defect and its inability to convert glucose into energy. It is a chronic disease in which the glucose level in the body is too high. It occurs when the pancreas does not produce enough insulin or it occurs when pancreas produces insulin but the body is unable to effectively use the insulin. Glucose comes from the food that we eat and the blood carries glucose to all the cells of the body and use it as an energy. But sometimes glucose stays in the blood and doesn’t reach the cells it can increase the overall glucose level in the blood and leads to the development of diabetes. When the nerves of the nervous system are damaged due to diabetes, it is known as diabetic neuropathy. People who are suffering from diabetes are at high risk of nerve damage and one can develop nerve damage at any time. Almost 60% to 70% of people who have diabetes are also suffering from some form of neuropathy. 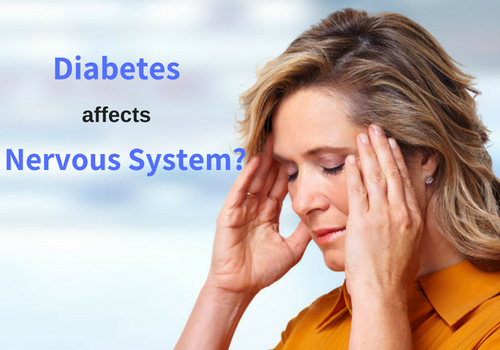 Too much glucose level in the body can cause damage to the nerves and can lead to the development of diabetic neuropathy. Peripheral nerve serves many different functions in the body and peripheral neuropathy is a medical term that is used to describe a condition of damage to the adjacent nerves. This disorder is characterized by the numbness, tingling, weakness and pain. Feet and the hands are the most affected areas of the body as the symptoms of this disorder usually starts with the longest nerve. Later it spreads to the legs and arms. Diabetic autonomic neuropathy is a common and the most serious complication of diabetes. It is the most neglected form of neuropathy and therefore can have serious complications on the health and on life. It affects the nerve that serves the heart and controls the blood pressure. It also affects the nerves in the lungs and the eyes. This type leads to the changes in digestion, perspiration, bowel and bladder function and sexual response. Proximal neuropathy is a rare type of nerve damage that is also known as diabetic amyotrophy. This type of nerve damage is characterized by the pain, weakness and changes in the sensation such as numbness in the legs. Thighs, hips, buttocks, and lower legs are the affected areas of this type of diabetic neuropathy. Initially, it begins with the pain in the affected areas and later as it progresses, it is followed by the weakness in the proximal muscles of the limbs. The pain affects one side of the body and can occur anytime. It begins with one side but later it affects both the sides of the bodies. Focal neuropathy is a disorder that damages the single nerves and this type of nerve damage is less common than other types of diabetic neuropathy. Hands, head and torso are the most affected areas. Symptoms of this type include pain, numbness and tingling in the thumb, index finger and middle finger. Sometimes it leads to weakness in the grip. Metabolic factors such as abnormal blood fat level, high blood glucose, long term diabetes play a role in the cause of it. Share it with your family and friends and aware them about this disease. In today's time diabetes is one of the most affected diseases around the world but still, people are unaware about the risk factors that are associated with diabetes. Diabetic neuropathies are the common disorders that most of the people suffering from diabetes deal with. It is essential to know about the causes and the symptoms of the diseases to avoid the risk of any future complications. Knowledge can help you understand and prevent any early signs. Stay Safe, Stay healthy!! How to Monitor your Diabetes with Glucometer?